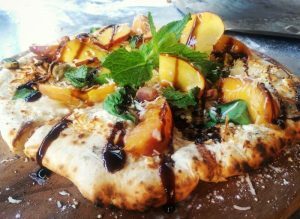 Everything made from scratch, Bomba Wood Fired Pizza offers a mobile food catering experience selling gourmet vegan and vegetarian friendly wood fired pizza at events and functions around Melbourne. Fully equipped with a mobile wood fired pizza oven, 4×4 Kombi van and collection of antique & rustic decor, they offer a classy, fun, delicious and unique catering experience for your special event. Their ingredients are fresh, locally sourced and organic where possible. For example, at markets, they source their veggies from other stallholders. They use 100% dairy free mozzarella style vegan cheese. They are also available for catering at private events, birthday catering, party catering, wedding catering, corporate events, family fun days, sports events, expos, car shows, charity fundraisers, cultural events & more! 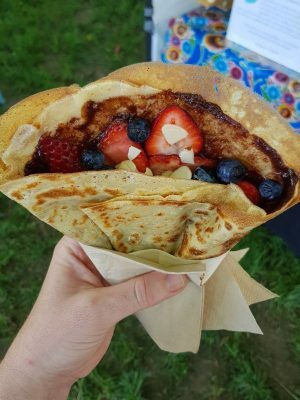 Crepe Collective make and sell ready-to-eat savoury galettes and sweet crepes at farmers’ markets. Their savoury galettes include potato, mushroom, capsicum, tomato and other vegetarian options. Their sweet crepes include lemon, choc-hazelnut, strawberry and banana. All their batters, spreads and sauces are homemade and they use speciality flour, such as buckwheat, to cater for the gluten intolerant. They aim to leave as little a footprint as possible, so their menu is designed to avoid food wastage and their packaging is biodegradable. Harry Hoo started making dim sims 20 years ago and now sell a range of asian entrees at markets around Melbourne. All of their products are made fresh weekly, using locally sourced ingredients wherever possible, and with no fillers, artificial colours or flavours. 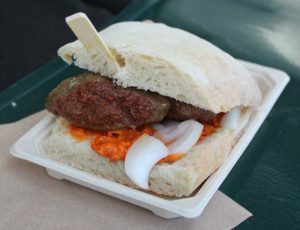 iVi’s Chevaps sell ready-to-eat chevapi (skinless, sausage-shaped meat patties, Balkan style) served in turkish-style bread with optional raw or cooked onions and ayvar (capsicum relish). They are cooked on a gas BBQ and are served on environmentally friendly recycled paper plates with a recycled paper napkin and wooden skewer to hold them together. The crepes are made using homemade organic strawberry jam, free range eggs and seasonal organic fruit when possible. 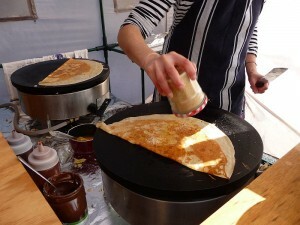 Marion hails from Brittany and the crepes are made from a family recipe handed down from generation to generation. 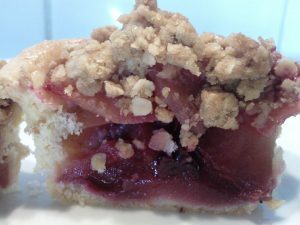 My Little Country Kitchen specialises in catering and fingerfood as well as bread, biscuits, cakes and slices. 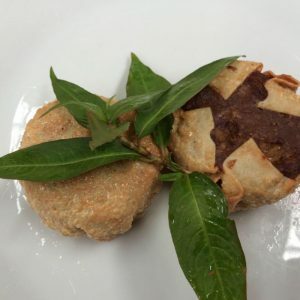 They provide fresh, delicious and beautifully presented food, all made to order. 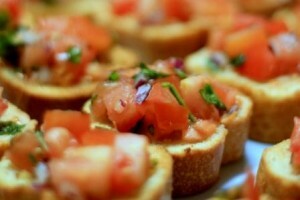 Type of catering include engagements, weddings, corporate/private functions and morning/afternoon teas.